Ice Cold Strawberry Kiwi Granita… red and green… tart and sweet… two amazing fruits that go so well together taste-wise and color-wise. I can still remember the first time I tasted a kiwi. I was barely a teenager. My dad, a grocer back then, came home one night with a brown paper bag and a proud smile on his face. He told us that he had a surprise for us. So he gathered my siblings and I around the kitchen table (all the important stuff happened in the kitchen around the kitchen table) and took out these fuzzy brownish things from the paper bag. He proudly announced that this new fruit was called a kiwi and that it came from New Zealand. I can actually remember thinking, “Where’s New Zealand?” (In my defense, I was only thirteen and very sheltered… after all, it was the seventies). Nowadays, I guess questions like that are easily answered by iPhones, etc. But back then I had to run into the family room to consult the atlas of our World Book encyclopedia. Life was much simpler back then! We also had no idea how to eat the kiwi. I guess we were clever enough to figure out that the fuzzy exterior should be peeled away, and the emerald green flesh should be focused on. But I do remember us trying to de-seed the fruit for a while… an exercise in futility, by the way. Eventually, laziness won, and we ate the flesh, seeds and all. kiwis can be sliced or quartered and eaten, with or without the skin. As I reflect upon this, it’s funny how my dad always tried to encourage his kids to try new things. The example of the kiwi comes to mind, but there were so many other instances that relay the same message. Today, on Father’s Day, I am aware of all the support I got and am very grateful for it. My husband planted a few kiwi vines in our backyard. Yes, in Montreal! It has been 2 3 4 years and surprisingly, the kiwi vines have made it through a couple of brutal winters. 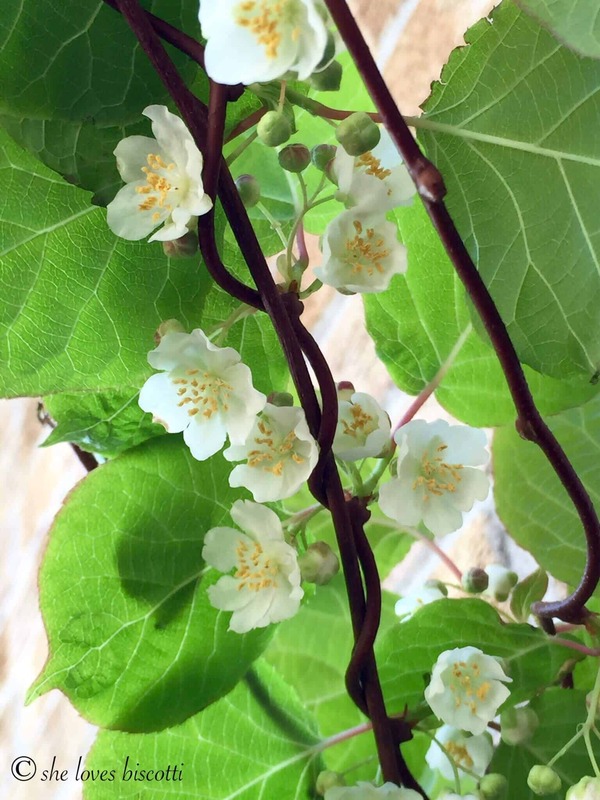 Despite the fact that we have yet to taste a kiwi from these plants, the blossoms are absolutely spectacular. As I was admiring their beauty, I thought to myself that it would be fun to make a kiwi granita. Since I also had strawberries in my fridge, I decided to pair the both of these super fruits together… and, as they say, the rest is history. Nutrition Note: The kiwi is truly a super fruit. Among other health benefits, consuming just 2 kiwis will provide you more Vitamin C than an orange! By the way, did you know that the exterior flesh can actually be eaten? I actually tried it once… and let’s just say that I prefer my kiwis to be peeled. 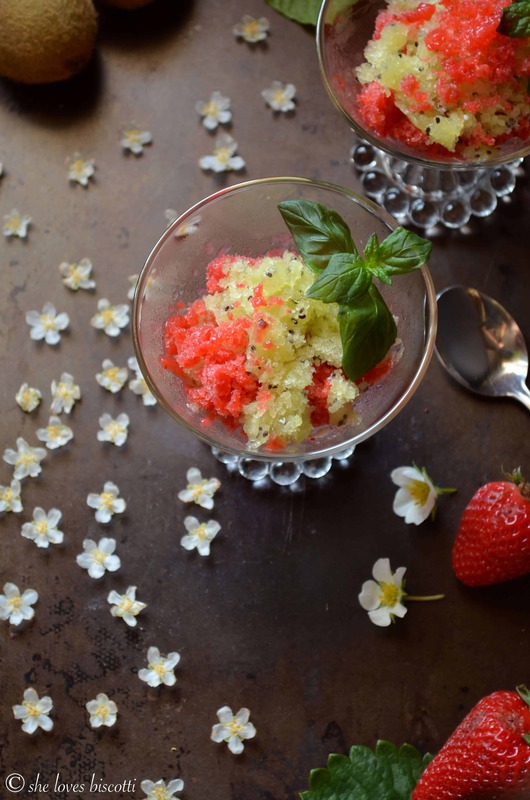 I got the inspiration to make this recipe for Ice Cold Strawberry Kiwi Granita from an article I found in the kitchn. 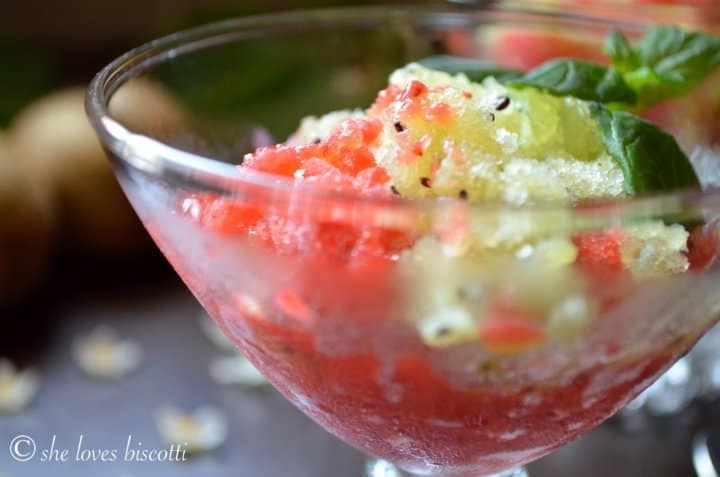 Just like the recipe I shared with all of you on how to made Homemade Italian Lemon Ice, and this recipe for Watermelon Lime Italian Granita Ice, it all starts with a simple syrup and some fruit. So, just in case you are wondering what you can do with kiwi fruit, how about a wonderful ice cold granita. As I sit here appreciating my refreshing Strawberry Kiwi Granita, I can’t help but think of the first time I tried a kiwi and the influence of my dad to experiment and try different foods. To all the dads… wishing you all a Happy Father’s Day! 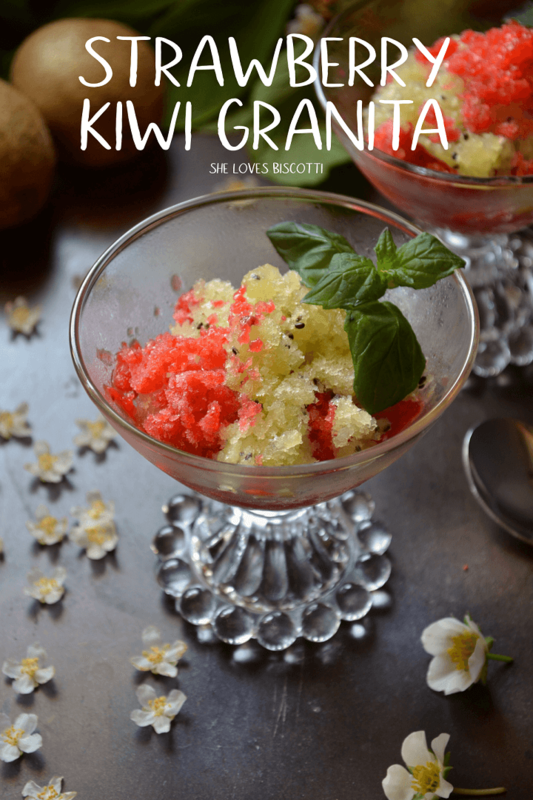 If you have made this kiwi granita recipe, I would love to hear about it in the comments below and be sure to rate the recipe! 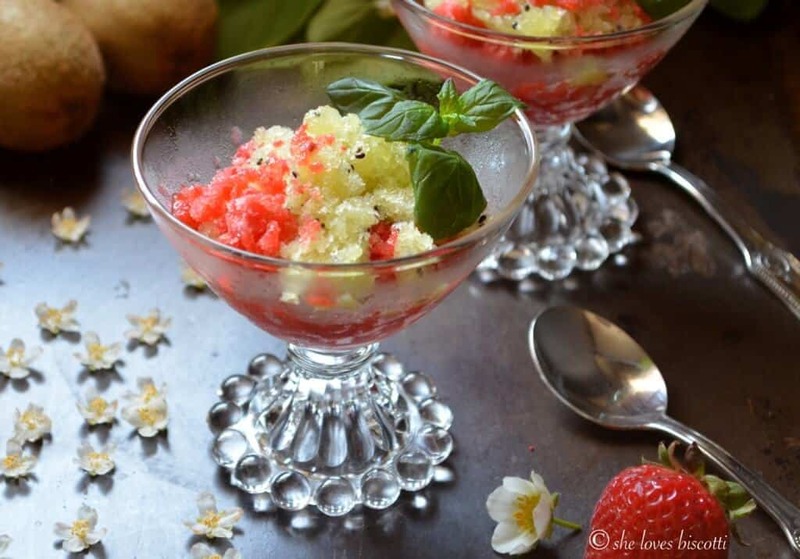 Ice Cold Strawberry Kiwi Granita ...red and green ... tart and sweet ... two amazing fruits that go so well together taste wise and color wise. Combine water and sugar in a medium saucepan. Bring to a simmer. Allow to cool down to room temperature. Place the strawberries in a food processor. Puree the strawberries for about 15-20 seconds. Add half of the lemon juice, a pinch of salt and about 1/4 -1/3 of the simple syrup. Puree together for another 10 seconds. Pour strawberry puree mixture in a shallow stainless steel pan. Repeat the same procedure with the kiwi but place the mixture in a different pan. Place both pans in freezer and stir to break up the ice every 60 minutes or so for 3-4 hours. The consistency should be granular but still slushy. At this point, cover and allow to freeze undisturbed for at least 8 hours. When ready to serve, grate the top of each and place in dessert bowl. Decorate with mint leaves (if desired). Feel free to adjust the amount of simple syrup that you put in your granita according to personal preference. 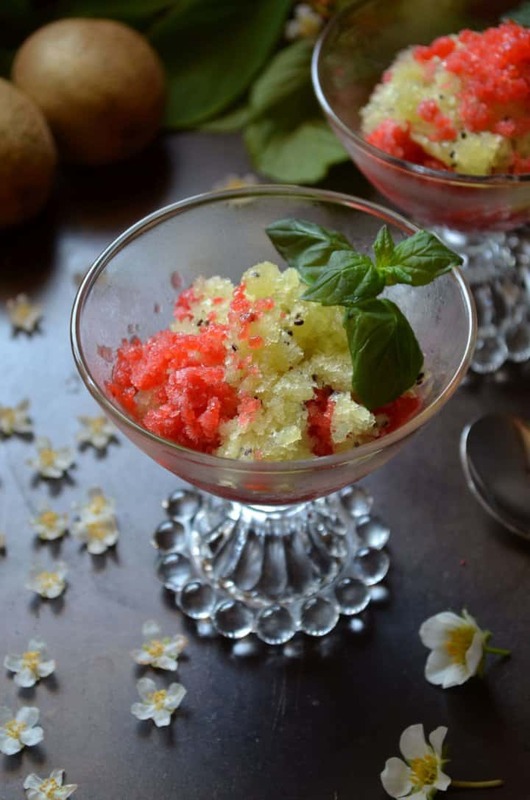 DO YOU LOVE THIS KIWI GRANITA RECIPE? PIN IT TO YOUR NO BAKE SUMMER DESSERTS BOARD! This is such a fresh and pretty recipe Maria! I’ve never actually made a granita at home before but you’ve inspired me to give it a shot. 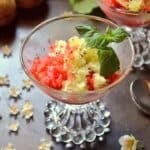 It looks like a perfect light dessert for the summertime. 🙂 Have a great weekend! What a great story about your dad! 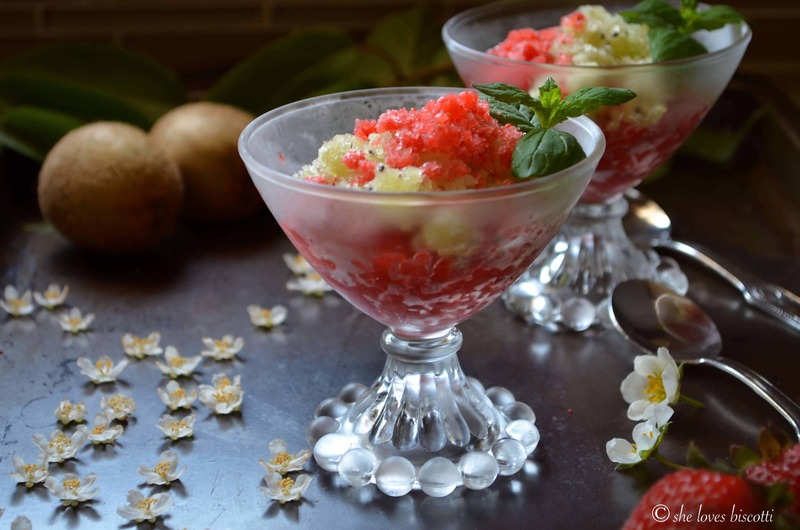 This granita looks super refreshing and very pretty. too. Perfect combination! What a beautiful summertime treat! It is funny the things we take for granted now with changes in technology, every question can be answered with “Google it”. Wondering about a kiwi would never happen now, which is sort of strange to think about (I’m such an old soul!!). I also grew up pretty sheltered so no judgements here 🙂 Love this recipe. It looks so refreshing, perfect for summer and hot evenings. Lovely post and recipe. Will have to try it in summer. Thank you Jovina 🙂 It was a very hot day in Montreal today and so it was appreciated by all!